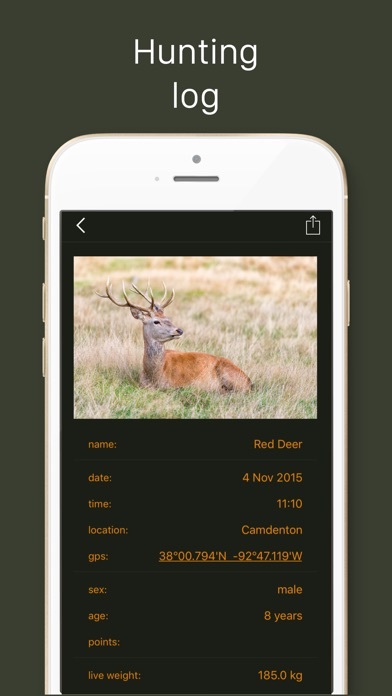 The best hunting app! With Hunting Calendar you will improve your hunting success. Plan your hunting trips based upon information on the sun and moon. 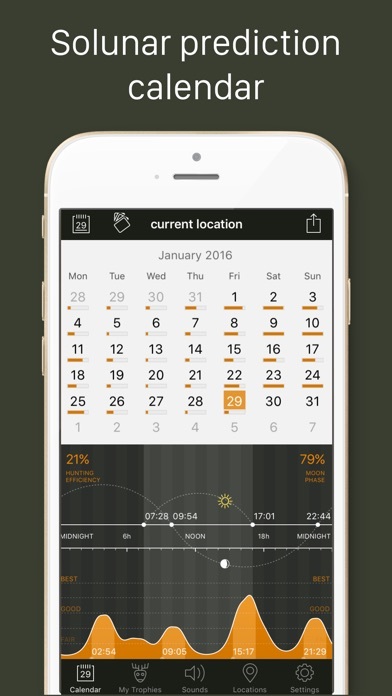 Hunting Calendar instantly displays best hunting times for your current location. Quickly choose days and times with the greatest probability of successful hunting. This amazing app also includes animal calling sounds with option to import your custom sounds. 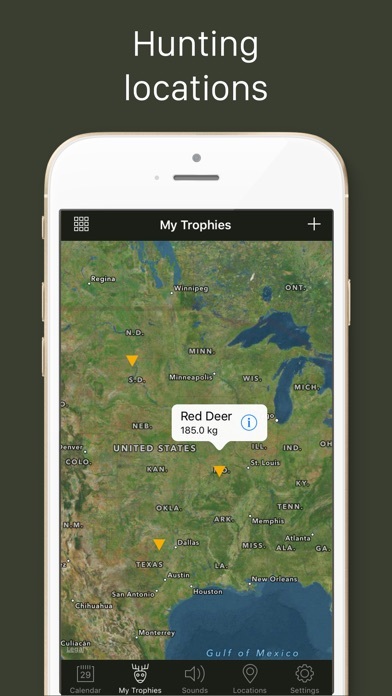 You can track your trophies with photo, age, weight, location, points, notes... for later analyze or just to tease your friends. Features: - Prediction of the best hunting times - Infinite prediction calendar with iCal share - Animal calling sounds with iPod library support - Hunting location with maps - Day, month and week view of hunting efficiency - Moonrise, moonset and moon overhead times - Moon Phase - Sunrise and sunrise times - Minor and major periods - Worldwide calendar for any location - Imperial and metric units - Buy once use on iPhone and iPad Save your time by targeting animals when they are most likely to be around, days, months and even years in advance! Solunar theory is one of the more interesting factors affecting hunting to consider. It essentially postulates that the position of the moon and sun effect hunting success. Got this app when Iphones first came out and I've gotten it in every phone since then. It's a must have and very accurate on animal movements, both land animals and fish. I have been using this app since it first came out. I find this app to be very accurate on movement for deer. I have started hunting on the peaks during the midday’s and getting away from the traditional morning and evening hunts. This app has increased my harvest tremendously. I give this up 2 thumbs up. I have use this app for years now, it has served me well. I have been able to see game at the times it gives. So it seems to be pretty accurate with the moon patterns. It also works well if you use it for fishing. 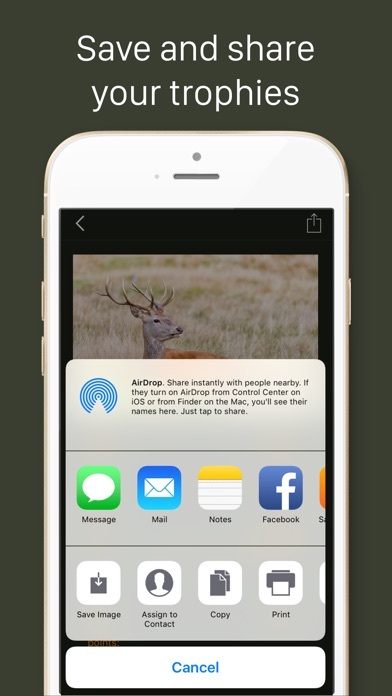 The layout at the App is easy to read and use. I guess I've got them all. This one tells me what I need to know at a glance. Outstanding! Enough said.